With summer in full swing, you want to entertain outdoors in a backyard that is something special. We’ve put together a list of what we think makes for a perfect outdoor entertaining area, including links to some of our past articles – see if you can’t find your next DIY project! for the kid’s pool parties? for relaxing with your family? Just like rooms in your house, divide your yard up into zones – dining, entertainment, and conversation areas. See where they best fit in your landscape and tie them together into a cohesive design. Your backyard may just need tweaking in order to have it just the way you want it. Water – This could be in the form of an in ground pool or maybe a backyard pond but a water feature will boost the value of your home and provide plenty of enjoyable days outside with friends and family. Covered dining area – Consider installing an awning or roof to protect your mealtime from bad weather. It would extend the usability of your backyard. A covering like a pergola or fabric curtains will give the space a romantic feeling. Grill – Whether it is charcoal or gas, summertime is grilling time so incorporate one into your entertainment area. Remember to give yourself storage space nearby to stash all your grilling accoutrement. Treat it like an outdoor kitchen, add a small refrigerator. Deck – It moves you out of the house and into the yard. 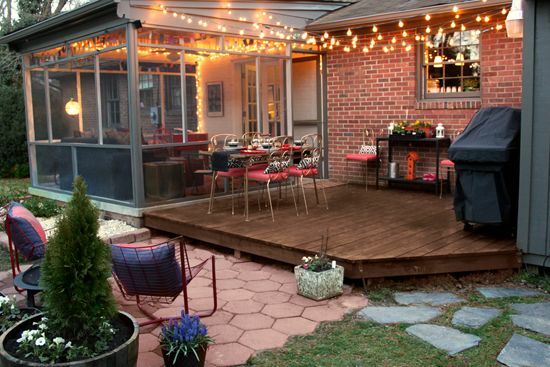 Your deck can be where your grill is located and where your dining area is. You can have different levels of a deck to include space for dining and conversation. Outdoor lighting and sound system – Trying to dine by the light of an outdoor flood light can kill the mood in a hurry. Consider lights for your deck, grilling area and walkways. Add speakers to your space so everyone can enjoy the music or the big game. Poolside Bar – If pool parties are your thing then having a convenient snack area close to the pool is a perfect way to extend the outdoor fun and keep wet feet out of your house. Lawn and garden – Having a section of lush grass for kids to play on or a beautifully scented garden to stroll through extends your entertaining possibilities into the far reaches of your yard. Scatter conversation areas throughout your garden by adding benches and lawn furniture. Outdoor fire pit – Summer always goes by so fast and installing an outdoor fire pit or fireplace can help extend your outdoor entertaining season into the fall. Use decorative design elements like colorful cushions, pillows, planters and garden art to help tie your entertainment zones together. Come up with an outdoor theme that reflects you and your family’s interests – favorite sports teams, places, travel dreams or heritage, for instance. Create the Perfect Entertainment Area for You! Your backyard is a blank canvas for you to create the perfect entertainment area. Hopefully we have given you some ideas on how to kick your space up a notch. So get busy! Summer is calling and that grill isn’t going to light itself. From circular saws and nail guns to orbital sanders and drills our expert staff is always on hand to help with your next DIY backyard project. As always, if you have any questions about pricing or how-to’s, don’t hesitate to contact us. Stop by our store — we’re open seven days a week.